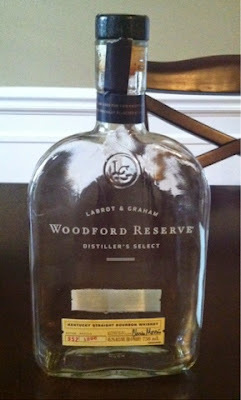 This is another staple in the bourbon industry that I felt I needed to give a go. I grabbed this bottle for a recent family camping trip, with the plan of sipping on a glass or two each night by the dwindling fire after the kids were in bed. The bourbon is a thicker, darker bourbon. On the first pour, this made it seem very promising to me. I took a sip and I got all the flavors I expect and hope for from a decent bourbon. I got an inoffensive nose of vanilla and wood, with a little spice. The flavor profile matched, starting with the same vanilla and wood flavors, with a hint of coffee flavor. But then it hit me. A flavor that at first I couldn't pinpoint, but one that stuck in the back of my throat. I was about halfway through my first glass when I realized what it was. Cherry cough syrup. It was distinct and unavoidable. I wouldn't notice it as the whiskey was in my mouth, but after each swallow, that was the taste that chose to stick around, and as with actual cough syrup, it stuck around for a while. I trudged through the bottle, but this is one of those times where the bottle only got worse the more I drank. I just could not shake that flavor, and, as I sit here writing this, I'm surprised I actually remembered anything else I may have noticed before having my senses offended. This is one that I will definitely stay far away from, and, if Woodford's other products share a common profile, I'll be hesitant to experiment with those.